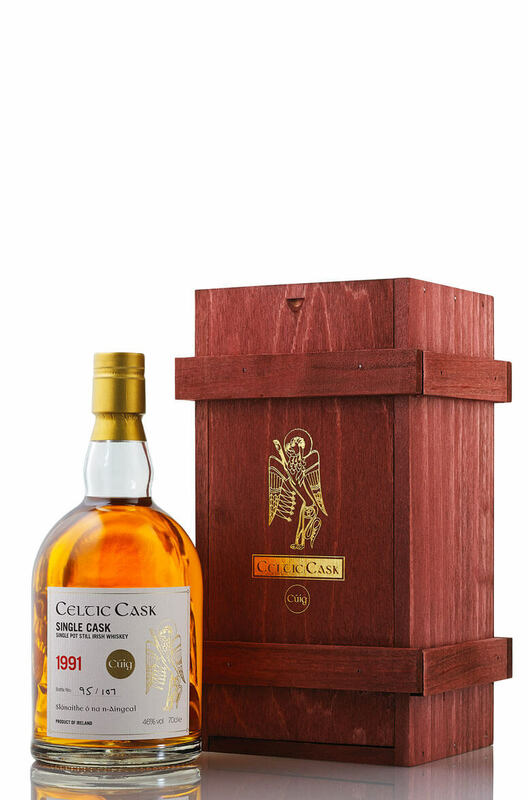 Celtic Cask “Cuig” was triple distilled in Ireland in 1991 and was matured in a first fill Bourbon cask for over 13 years. It then spent the next 8 years out of cask before we rescued it from the angels grasp! It was bottled as a Celtic Cask in September 2013. This is Irish Single Pot Still whiskey from a distillery who's identitiy we are not allowed to reveal. Nose: Intense and complex with aromas of dried citrus peel with touches of ginger, allspice and mocha. Taste: Juicy, complex and spicy. Great depth of flavour. Flavours of dried fruits,boiled sweets, citrus peel and allspice. Finish: Gloriously spicy and oily. Like an old, heavy pot still whiskey but smoother and more refined. Nose Intense and complex with aromas of dried citrus peel with touches of ginger, allspice and mocha. Palate Juicy, complex and spicy. Great depth of flavour. Flavours of dried fruits,boiled sweets, citrus peel and allspice. Finish Gloriously spicy and oily. Like an old, heavy pot still whiskey but smoother and more refined. Distillery Top Secret...Not allowed to reveal! Another great finishing in our slightly famous Anima Negra casks. Anima Negra is a highly regarded w..